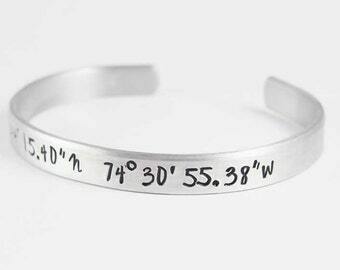 Personalized hand stamped jewelry and accessories. Announcement hand stamped bracelets, made to order jewelry, keychains, necklaces all this are customized products that you can find in my small shop. 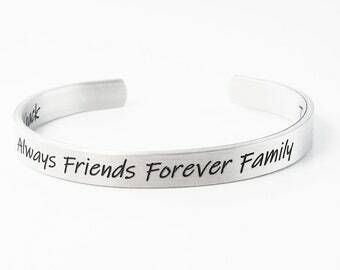 We are specializing in personalized bracelets and all kinds of jewelry. Each product is one of a kind. Each letter is stamped one by one. hand stamped bracelets, made to order jewelry, keychains, necklaces all this are customized products that you can find in my small shop. We are specializing in personalized bracelets and all kinds of jewelry. Each product is one of a kind. Each letter is stamped one by one. Mom by day, Jewellery creator by night. I always do orders as I do for my self, all are important. I know how great it is to receive a handcrafted piece of the highest quality and how exciting is awaiting for delivery. I am sure that is why you are on Etsy. So... have a look in my shop. Please keep in mind that I create and stamp in the metal by hand and not all the letters will line up or by stamped perfectly like with mass produced items. I think It makes it unique. Have a look around and if you're after a custom listing just get in touch and we can discuss whatever you have in mind. I always do orders as I do for my self, all are important. I know how great it is to receive a handcrafted piece of the highest quality and how exciting is awaiting for delivery. I am sure that is why you are on Etsy. So... have a look in my small shop. Please keep in mind that I create and stamp in the metal by hand and not all the letters will line up or by stamped perfectly like with mass produced items. I think It makes it unique and this is no reason for return or exchange. Because all products are made to custom order no returns will be accepted. If something is incorrect with the order, let me know asap and I'll fix it. Back side stamping if offered will not be centered. There can be small difference in products size +/- 1 or 2mm. This won't be considered as error. As soon as I finish your order I'll send it out and you will get a notification. All orders are send with registered international priority airmail. If lost, you will get refund or I'll send it again. For international overseas shipping, depending on the destination, delivery may take about 21 business days. For order placed in November/December up to 60 days and because I don't have influence on it it's not considered as delay and it's not a reason to ask for a refund. I can't rush it because it depends on post office and customs clearance. I'm not responsible for postal delays. For some countries tracking will be working only until leaving Poland. If you need tracking for all the way please choose express. It cost more but ionce shipped it takes about 3 business days to arrive and it has tracking for all the way. All orders are registered and for some coutries you will need sign on delivery, if you're not present while delivery you are responsible to collect it from your local post office before they will send it back. I don't offer refunds for unclaimed mail. Each order have insurance against lost. If your item won't arrive within 60 days from shipping I can file a formal complain. If it's overseas mail it may take up to 60 days to get answer from post office. I can't rush it and offer refund or re-shiipng earlier. After getting answer your order will be re-shipped or refunded. If you don't accept it please don't buy. If you give us wrong address, zip code etc. you are responsible for re-shipping fee. I don't offer delivery by specific date. If you'll mark that it is "needed by" a specific date I don't give warranty that it will arrive by then. It depends on post office. If you will not write a specific message in notes to seller box at checkout your order will be done as on listings main picture. If your order won't arrive within 60 business days please let me know and I'll place official complain at Post Office. Once I'll get answer you'll get refund or your order will be sent again. Custom order can't be canceled or refunded. Shipping details are availible at your purchases section. • We send order to Etsy shipping address. Please, make sure it's correct! It's not possible to change address. • You can have your purchase sent directly to another recipient's address. When ordering via Etsy, please fill contact and shipping information of person, who will be the recipient of that particular order. How to order personalized product? Please place the order and then say in the "note to stampedworld" box, before check out, the exact personalization you wish. Free Organza Bag Gift Wrapping!